First comes love, then comes marriage, then comes baby! 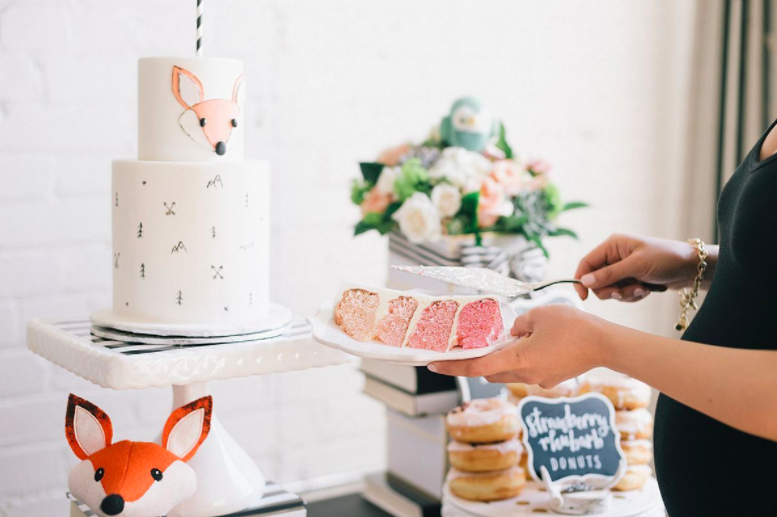 Here are some creative ways to use Weddingstar products for a baby shower. Boy or girl, it really doesn’t matter with this Modern Wilderness styled party collaboration. It’s easy to get the look by combining simple black and white graphics with pops of color and whimsical woodland elements. This “love” acrylic white cake topper was given a whimsical modern look by adding a black and white candy striped paper straw. How fun is this floral and succulent combo! We love helping Krystin Lee from Suburban-faux-pas with any of her dinner party needs. With finicky weather, she decided it would be best to host inside. With florals hanging from the chandelier and garland runner for the table, we really did bring the outside, inside. We also incorporated the Stella Artois Chalice into our décor by adding tea lights for some mood lighting come dusk. In an effort to personalize place settings for guests, we hand-stamped custom name cards affixed to a rose and attached them to linen napkins. Inspired by both industrial modernity and summer, this styled shoot is filled with lush greenery and shiny metallic accents. Gold, geometric decor reigns supreme, from the contemporary reception chairs all the way to the prismatic centrepieces. Ultimately, it's the beautiful combination of natural floral arrangements and gilded structures that give this shoot its modern feel! We couldn't of been more thrilled when Suburban Faux-Pas blogger Krystin Lee asked us to help her with the florals for her girls night in! It was a bohemian inspired party in her living room, which she completely transformed with poufs, large pillows, balloons, and of course fresh florals. We decided to go with a very free spirited design consisting of some gorgeous pink and white tones; and lush greens. Intertwined we added different height candles, as well as different sized vases to give it that boho feel. In our design we used fluffy white dahlias and some very pretty locally grown pink garden roses. Gorgeous buttercream cake by Sweet Cakes and Co.
Krystin serving up some fun Palm Bay cocktails!